It’s come to my attention that a lot of the people who I link this blog to have no idea what half the words I use mean. I’d use English words if I could, but often there is no viable equivalent, and I have to resort to using the Japanese word. In an effort to make this blog more user-friendly for the four people who actually read it, here’s a glossary of regularly used kimono terms that will be periodically updated. Update, for your convenience. I have added a feature that gives you these definitions within entries – simply hover over any unfamiliar loanword and a small tooltip will pop up with a definition! Chirimen – A type of textured silk crepe, less casual than rinzu (see below). Chuuya – Popular vintage style of obi. Literally means night/day, typified by two contrasting sides, usually one light and one dark. Fukuro – Full-width formal obi, can be fully decorated (zentsuu) or 60% patterned to save fabric (rokutsuu). Furisode – Long-sleeved kimono worn by young, unmarried women. Hakama – Pleated trouser- or skirt-like garment worn over kimono, by both men and women. Often worn by men for formal events or martial arts, and by women for graduation ceremonies, but may be worn in other circumstances. Hakata – A type of textile weave typified by graphic, geometric-like stripes. Lush silk, from the Hakata region. Hakkake – Lining of the bottom half of kimono, often decorative. Haneri – Decorative collar sewn onto the juban (see below) to protect the garment as well as accessorize. Hanhaba – Casual, half-width obi. Haori – A type of kimono jacket. Heisei – Heisei Era, from 1989 to present. Kimono are subdued, with vintage trends on the rebound. (See also Meiji, Showa, Taisho). Hiyoku – An inner layer on formal kimono, to give the impression of wearing multiple garments. Houmongi – “Visiting wear” dressy kimono with over-arching designs from shoulder to hem, and on sleeves. Sleeves of a mid length, can be worn by almost all women. Dressy but versatile. Iromuji – Solid-coloured kimono. Generally subdued but pretty colours, pinks, greens, purples, etc. Very versatile, can be worn by married or unmarried women, dressed up or dressed down. The “Little Black Dress” of the kimono world. Irotomesode – Coloured short-sleeved kimono with designs only below the knees. Formal, typically worn by married women but may occasionally be worn by older, unmarried women. Kurotomesode – Black short-sleeved kimono with designs only below the knees. Very formal, worn by married women. Kimono – The main garment. Typically silk but may also be synthetic, linen, hemp, cotton, etc. Very linear in shape, with a long straight body and square or long rectangular sleeves. Kitsuke – The act and art of wearing kimono. Komon – Casual kimono with an evenly-spaced all over design. Can vary from very subdued to very bold. 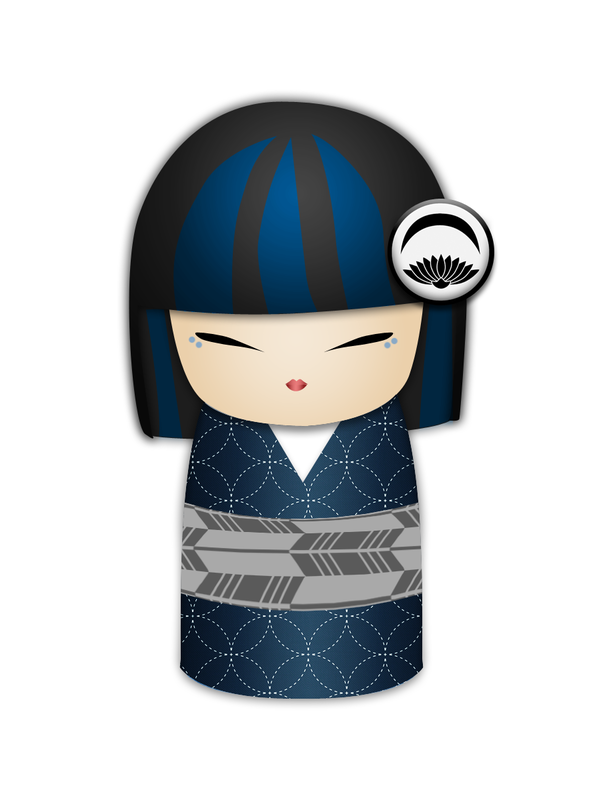 Komono – Yes, this one’s confusing, as it looks very similar to kimono. Komono is all the little bits and bobs necessary for dressing. Maru – Vintage style of formal obi, typefied by a small allover pattern. Meisen – A textile where the threads are pre-dyed and woven in a specific manner to form a distinct pattern. Typified by slighty “blurry” edges of the design. Michiyuki – Typically longer coat than haori (above), closes in the front with snaps or buttons, also has at least one pocket. Mofuku – “Mourning clothes”. Solid black garments worn only to funeral. Generally taboo to wear otherwise, but small accessories in black are becoming more commonplace. Musubi – Decorative obi knot or bow tied in the back. Nagoya – Casual practical style of obi, narrow around the waist and widening in the drum part. Obijime – Silk cord that holds the obi and musubi in place. Ohashori – A fold at the waist of the kimono, used to adjust length and shape, and generally visible below the obi. A sign of a well-fitting kimono is the ability to make a tidy ohashori. Rinzu – Smooth silk with a tone-on-tone figured, damask-like woven design. Often used as the backdrop for more elaborate decoration. Shibori – A traditional method of tie-dye typified by tiny raised bumps where the knots are tied. Incredibly labour-intensive and distinctive. Tomesode – Short-sleeved kimono worn by older, usually married women. Tsukesage – Like Houmongi (above), but patterns separate and distinct on each fabric piece. Slightly less dressy but still very versatile. Tsumugi – A rough, slubbed silk, similar to Dupioni. Typically less formal than other weaves, however high-end tsumugi can have an incredibly luxurious feel. Urushi – A weave using lacquered threads, resulting in a stiff, shiny design. Yukata – Informal cotton kimono, often worn during festivals or at resorts. Yuzen – Resist-paste dyeing that results in a rich, lush, painterly look. Often enhanced with gold paint or leaf. Zori – Dressy kimono sandals with a stacked sole, typically patent leather, silk, or nice vinyl.